The world of software development is a world full of metaphors. Since its early days, software development has been compared to fields like writing, construction, and even rugby. Metaphors are important for understanding unfamiliar topics and, yes, even in the 21st century, software development — with its own set of peculiarities — is still unfamiliar to many, including people who have worked in the software industry for decades. Today, I would like to contribute yet another analogy by comparing a software project to a ladder. 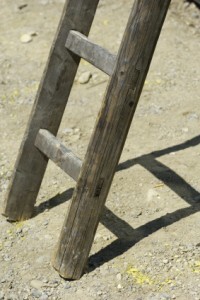 A classic wooden ladder is made of two rails and multiple rungs, mounted together with wood glue. No matter what kind of ladder you build — short or long — you need two firm rails that act as a framework for the rungs. In software development, the first rail corresponds to the people and the second to the process. It is fairly obvious (and much has been written elsewhere about the fact!) that you need the right people in order to succeed. Right means highly motivated, proactive developers with the required skill set for the job at hand. But you also need the right process that makes sure that developers are going in the right direction. The process doesn’t need to be heavy and bureaucratic (it shouldn’t be, in fact), but it must ensure that work progresses steadily towards the final product and that no important aspect of the product is overlooked. In short, a systematic process is essential to remove the “chance factor” from a software project. Once you have the rails you can add rungs. Rungs will ultimately determine how long your ladder will be. Every rung gets you higher and closer to your goal. In software development, rungs correspond to practices. Practices like continuous integration, unit testing, refactoring, static analysis, just to name a few. While the process has long-term, far-reaching influence on a software project, practices are micro-processes, steps that are taken by developers on a daily or hourly basis. Processes are strategic, practices are tactical. Each rung on a ladder only has a small impact on the overall length of the ladder, but it is the sum of all rungs that makes up a ladder. To get a sturdy wooden ladder, you have to put wood glue inside the notches. This way, you ensure that the rungs will stay in place, even under load. Even if you have the best-quality rails and rungs, your ladder will sooner or later fall apart without glue. In a software development project, glue corresponds to the environment that an organization provides to the team: quality of offices and technical equipment, but also issues like work appreciation, salary, and overtime — in short: how people are treated. These factors influence developer motivation and productivity and whether they will stay with the project and the company. In a bad environment sustained quality work is impossible. I know that every analogy breaks down at some point but what I like about the “Ladder” metaphor is that it doesn’t favor any particular element. For a successful project, one that delivers a great product on time, everything needs to be right: people, process, practices, and environment.